Here is yet another way to win a seat and a travel package to the Bar Poker Open! At the end of the Super League season, each of our regions will host a Kontenders Super League Live Championship. BPO Seats will be awarded to the top finishers at these live events. The total number of seats to be awarded will be based on the number of Bar Poker Open events that take place during the season, and will be announced after the season ends, prior to the live event. Additionally, the top three finishers in each region will advance to the Kontenders Super League Online Final, where the winner will receive a full travel package to the event in Las Vegas! To qualify, just accumulate as many Super League points as you can during the season. The number of players who qualify from each region will be twice the number that qualify for the Bar Poker Open Super League Final. As an example, in the following region, with 52 qualifiers for the BPO Super League Online Final, we would have 104 players qualifying for the Kontenders Super League Live event in that region. This can be found above, under Major Events->Bar Poker Open->Super League Standings. 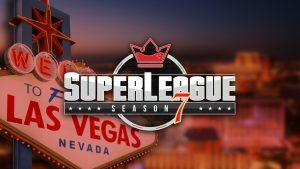 Again, the top three from each Kontenders Super League Live Championship will compete in a league-wide on-line tournament for a Travel Package to Las Vegas. This will be held on our own play site and will only include Kontenders players who finished top three in their regional events. If the event were to be held today, with nine regions, there would only be 27 qualifiers for this online event, and one of those 27 would be guaranteed to win a travel package!